Winx sure showed who was boss when she lashed out after her final trackwork gallop on Thursday and trainer Chris Waller believes it’s a good sign she’ll show who’s boss again in her farewell race on Saturday. The combination of Waller generously removing her earmuffs to show her off post-gallop, cameras clicking as a big media contingent followed her every move – and a rug that was tugging at her backside – combined to make the mighty mare fractious. Waller and Winx’s handlers quickly cleared a path along the Rosehill birdcage walkway to allow the seven-year-old to leave, but after clearing the immediate area she got agitated again and lashed out hard a couple of times. One of her kicks left a hole in a Longines advertising sign along the fence, which Waller later agreed was probably a good omen since the Swiss watchmakers are sponsoring the $4 million Group One Queen Elizabeth Stakes over 2000m that Winx will contest at Randwick. It certainly appears as if she’s ready to kick the opposition’s brains in and record a 33rd straight win on her way out. 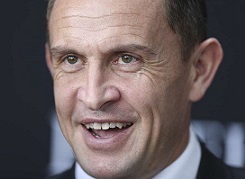 After all the excitement had subsided, and Winx had departed safely, Waller spoke to the media pack, which included cameras representing 14 television networks – nearly half of them from overseas. “As you can see, she’s a horse, they’re unpredictable, but she’s very well, very fresh, very bright, ready to go and obviously it’s a big morning with a lot of cameras and people everywhere and, yeah, they can get a bit fresh from time to time,” he said. “And she’s certainly ready to explode is probably the better word of this morning. “I shouldn’t have taken the earmuffs off this morning. I just wanted to take them off so you could all see her without the earphones, but as soon as I did she could hear the clicking and the clacking and so I probably shouldn’t have done that. Later, Waller confirmed Winx had not taken any ill-harm from the incident. “There were so many people here and she had the rug on and it was sort of grabbing on the bum and I don’t think she liked that too much, so we just wanted to get her out safely,” he said. As far as her work on the course proper went, Bowman reported it as typically perfect. “Very good, very strong, she’s certainly ready for a peak performance this preparation, I believe,” he said. The countdown to Winx’s final race in front of a sell-out crowd in excess of 40,000 at the track where she has scored many great wins already is now on in earnest. Winx will start at very short odds to win, but as Bowman warned it’s still a horse-race and not a walk in the park, so you’ve got to keep your wits about you. Now, with the seven-year-old racing as well as ever and as well prepared as she can be for her last race, we all wait to enjoy the day.